The Table Is In Replication - Why Does SQL Server Replication Seem To Ignore It? There are occasions when Updates, Inserts, and Deletes on a replicated table do not replicate out to the Subscriber. You've verified that the table is listed in the Articles included in the Publication, and that there is at least one Subscription on the Publication. This is a problem I have run into on a number of occasions and it all boils down to the Subscription on the individual Articles within the Publication. Wait, we were talking about a table, what do I mean by Articles? I'm glad you asked! In this case, I am referring to a table, but the problem could affect any of the replicated Articles, so I will refer to Articles for the remainder of this post. When you first create a Publication, you are defining what Articles to replicate. You then create a Subscription to define what Subscriber you wish to push the data to. When you create the Subscription, under the hood SQL Server actually activates the Subscription on each Article within the publication. You can have multiple Subscriptions on a single Publication to replicate the Articles to multiple Subscribers. 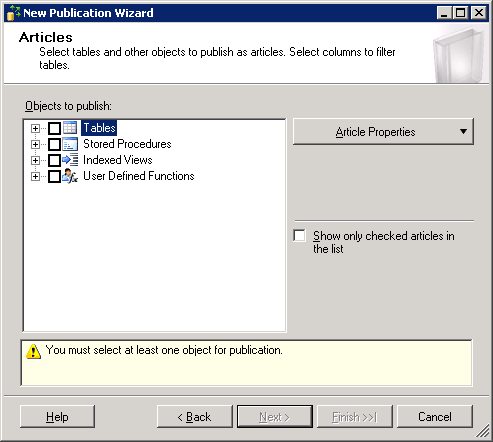 When you add articles to an existing Publication with an existing Subscription, the GUI automatically executes a Stored Procedure (specifically sp_RefreshSubscriptions) to then activate the existing Subscription(s) to the Article you just added. Usually, this whole process executes without issue and data starts flowing for the new article once a snapshot has been generated and delivered (or immediately, if you used the 'replication support only' option in the Subscription). Unfortunately, the process to create the Subscription on the Article can sometimes fail. This seems to be more prevalent when the Article you are adding to the Publication is very active and there is a potential of blocking the replication setup processes. Even more unfortunately, it fails silently, so that there is no indication that anything has gone awry. The only symptom is that data does not flow for that Article to the Subscriber. This will show a list of all Articles in all Publications in all databases on the current server that have an inactive subscription. The script to address the issue only addresses one database at a time. Since you will likely have to manually sync data for the Articles that were not properly replicating, this script allows you to address the out-of-sync problem in smaller, more easily addressable pieces. There are many options to choose from when manually syncing objects and a tool like Redgate's SQL Data Compare may come in handy for that task. The above process has helped us resolve this issue on numerous occasions. Hopefully, it helps you if you encounter the same issue! In SP2 for SQL Server 2014, the system SPROC sp_MSreplraiserror has been updated to support an additional parameter for additional error logging detail. This is good! When we updated the Publisher with SP2 for SQL Server 2014, the replication SPROCs that actually perform the work (sp_MSdel_*, sp_MSins_*, and sp_MSupd_*) were updated with the additional parameter value to specify when running the sp_MSreplraiserror SPROC. Unfortunately, the Subscriber (which is where the SPROCs are executed) has not yet had SP2 applied and thus the error is thrown because the system SPROC sp_MSreplraiserror has not yet been updated to support an additional parameter. To mitigate the issue, I edited the sp_MSdel_* and sp_MSupd_* SPROCs (the sp_MSins_* SPROCs do not execute sp_MSreplraiserror when an error is encountered) and commented out the very last parameter. Once we apply SP2 on the Subscriber, I will go back in and uncomment the last parameter to gain the additional error logging detail. The cluster group cannot be determined for the instance name 'MSSQLSERVER'. This indicates there is a problem with the product registry setting for ClusterName, with product discovery, or the cluster resources. This particular FCI was a DR cluster and we had renamed the network name resource for the instance to match the production server it was replacing. I believe the instance name in the registry should automatically change when you change the network name, but in our case it did not do so. To find the correct name, I launched Failover Cluster Manager and then expanded the cluster name and selected Roles in the left-hand pane. From there I selected the Resources tab at the bottom of the center page. Note: I'm running Windows Server 2012 R2. If you are on Windows Server 2008 (or 2008 R2), you'll need to expand Services and applications in the left-hand pane and then select the specific service you are looking for. In the Resources list, I found the Server Name resource and made note of the value specified there. Note: MSSQL12.MSSQLSERVER will vary based on SQL version (SQL 2012 is "MSSQL11") and instance name ("MSSQLSERVER" is the default instance and named instances are the actual instance name instead of "MSSQLSERVER"). I then ran the CU install again and it completed successfully! So far this is a good Monday! Recently I observed an issue with bringing up SQL Services in a clustered environment. In this particular Windows Failover Cluster, there are two instances of SQL Server that typically run on the same physical node in the cluster. All of the clustered services ran without issue on the primary node. When the instances were failed over to the second node, the SQL Server services would start, but the SQL Agent services would not start. Failover Cluster Manager was reporting Error 422 bringing resource online. Our investigation efforts ended up being fruitless as there was no additional detail reported in Failover Cluster Manager or the Event Log. There was no also SQLAGENT.OUT log file generated for that particular service start attempt. Once the SQL Agent services were reset to Manual (they should not be set to Automatic in a Windows Failover Cluster), we were able to bring the clustered SQL Agent services online through Failover Cluster Manager without issue and the cluster reported that it was completely healthy. There are a few other scenarios that can cause this issue, but hopefully this helps if you also have someone “helpful” reset your clustered services to Disabled. I've attended Red Gate's SQL In The City Seattle 2012 and SQL In The City Charlotte 2013. This year, I not only had the privilege of attending SQL In The City in Seattle event, but I was thrilled to be selected to speak at the event! It's a fantastic opportunity to share my passion of SQL Server with others. John Theron (President of Red Gate) and Steve Jones (SQL Server MVP) presented the keynote which focused on Database Lifecycle Management, "Ship often, ship safe." You can catch a recording of the keynote here (from the London event). After the keynote, I caught Steve Jones session on Avoiding A DBA's Worst Days With Monitoring. It was a great session that highlighted the importance of monitoring SQL Server so that you know what's going on so you can quickly respond to sudden issues and anticipate performance slowdowns before they become critical. SQL Monitor v4 was featured and is a fantastic option for monitoring your database servers. I followed Steve's session with my own, 101 Stupid Mistakes Your Colleagues Make When Setting Up A SQL Server (because, of course, no one that is reading this would ever make any of these mistakes). You can snag the slide deck here if you're interested in checking out the presentation. The presentation went very well, there were great questions and audience participation. Lunch was a great time to hang out with members of the SQL community and chat with Red Gate product experts. After lunch, I attended Kevin Boles session on new SQL Server 2014 features (I'm in the middle of a SQL Server 2014 upgrade project, so this was a key session to attend). I also attended Bob Pusateri excellent session Passive Security For Hostile Environments. Bob blogged about the SQL In The City event here. Overall, it is a fantastic, free event to get your SQL Server learning on and get ready for the main event, the PASS Summit. This is a brilliant option if you can't get your company to pay for a pre-con at the PASS Summit, and I very easily convinced several friends to attend the event (it was an easy sell for their employers, as they only had to cover an additional day of food and lodging in exchange for another full day of SQL Server training). Many thanks to Red Gate for selecting me as a speaker. I had a blast and I look forward to attending (and hopefully speaking at) the event again next year.